I've been a member of Mypoints for a long time. I didn't realize how long I'd been a member until I received my "Happy Anniversary" email this morning. As shown in the picture below, I've been a member of Mypoints for 11 years!!!! How does it work? Basically, once you sign up and complete your profile, you have several opportunities to earn points. The minimum point level is 5 points and the quickest and easiest way to earn points is to read the e-mails they send. I usually get anywhere from 2 - 10 e-mails a day. There is no time limit to read the e-mails but I usually click on them daily. Even if I get 10 e-mails in a day, it only takes about 2-5 minutes to complete them. You can also earn points by completing surveys and by shopping online. What do you get? Once you have enough points in your account, you can redeem them for a variety of gift cards. 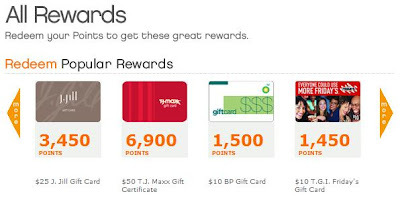 The lowest value gift cards start at 500 points and increase to several thousand points. The points value increase with the dollar value of the gift card. Once you choose to redeem your card, the gift card is then mailed to you within 1-3 weeks. They do have several gift cards that you can redeem online. If you haven't signed up for a Mypoints account, it's really quick and easy to do so. Once you open an account, you can then refer friends to earn even more points!! Over the years, I've redeemed the gift cards to Target, TJ Maxx, Home Depot and my favorite - Starbucks!!! This is one of the ways I can continue to enjoy my Starbucks coffee guilt-free. If you are worried about getting a lot of spam, I recommend setting up a separate email account. 11 years. That is really an impressive run. MyPoints is definitely one of the better programs out there that doesn't require too much effort. I've been a member of MyPoints for an ridiculous amount of time too. Lately I've been doing my shopping through Ebates (for cash) but I'll still check MyPoints as well to see who has the best deal. I've been a member of MyPoints for a long time. I like the straightforward program. No complicated schemes or bait-switch tactics. I highly recommend it. I'll have to check it out. Sounds easy, and I absolutely love gift cards. Especially Starbucks! Mmm! MyPoints is a great program. For many years I redeemed my points for gift cards which I then used for birthday and Christmas gifts. Now that the rewards card is no longer viable, the points don't add up as quickly as they used to. Wooouw...it's very long time has a member! very loyally!Great! Okey, thanks very much on your info...I'll follow you!.. I'll give my points out a try. I usually reward myself by saving, seeing digits grow in my account makes me happy.No matter how much or how little you're paid, never spend more than what you are earning. It is obviously easier to spend than to earn, with your cost cutting efforts in various aspects this will in the end result to big savings, it need not always to be big sacrifices.